Tortilla chips and salsa, or hummus and pita chips? With my Mexican-Inspired Hummus with Avocado, you get the best of both worlds! Creamy avocado and puréed chick peas (don’t forget the tahini) cozy up with a jalapeño, fresh cilantro, olive oil, and a combination of citrus juices. You’re going to love it! Summer of 2017, my husband and I spent several days with 2 of our sons, their spouses, and our little grandsons in Asheville, North Carolina. Our first stop on the way into the city was the Sierra Nevada Taproom. Their menu is quite varied, and features local and fresh ingredients whenever possible. Their gorgeous property includes an extensive garden with fresh herbs and produce. We ate (and drank 😀 ) at Sierra Nevada twice. Spectacular. One of the items I had was a Moroccan Skewer with a Chickpea Avocado Mash. OMG! That flavor combo left quite an impression. I took notes (because my 58 year-old brain forgets food even when it’s amazing). We spread about half of the hummus on a grilled flatbread pizza with ceviche (future recipe), and polished off the rest with the baked chips. With the aid of a food processor, this comes together in a flash. What are you waiting for? Tortilla chips and salsa, or hummus and pita chips? With my Mexican-Inspired Hummus with Avocado, you get the best of both worlds! Creamy avocado and puréed chick peas (don't forget the tahini) cozy up with a jalapeño, fresh cilantro, olive oil, and a combination of citrus juices. 1/2 teaspoon sea salt to taste! Arrange tortilla wedges in a single layer on a baking sheet (or two). Spray with cooking spray. Sprinkle with sea salt. Bake 10-15 minutes until golden brown and crispy. Remove and set aside. Add all ingredients to the bowl of an adequately sized food processor. Pulse until smooth. Check consistency (do you want it looser? ), seasoning (more salt? ), and acidity. Make adjustments. Pulse until well-combined and smooth. Scrape into a serving bowl (use a spatula so you don't leave any behind!). Make a "well" in the center, and add a bit of olive oil. Garnish with toasted pepitas and chopped cilantro. Serve with baked chips! Drain and reserve the liquid from the can of chick peas. You can use it to thin your hummus rather than adding additional acidity or fat. Meyer lemons are available locally, so I used half Meyer lemon and half lime juice. Lemon juice is the traditional Mediterranean citrus used. Make it your own! Macronutrients (approximation from MyFitnessPal.com): 78 calories; 2 g protein; 6 g carbohydrates; 5 g fat. Based on 15 servings and does not include chips. Macros just to give a ballpark idea. This recipe makes about 2 1/2 cups. Hummus and avocado are both some of my favorites, so I can only imagine how delicious they would be combined! I definitely need this recipe in my life. So yummy! I think he'd love it Veronika! Once you make it yourself, you'll never look back Karyl! Enjoy! I love that you have paired two of my favorite dips - such a great idea! So easy to put together and homemade is always better than the sloppy store bought! I agree 100% Carrie! They're so quick and easy to make, and I really hate that "packaged taste." We are alway making a traditional hummus at our house on weekend and I think we need to try your recipe next. Thanks for sharing! My pleasure Analida! It's always fun to switch up a traditional dish. I hope you like it! OMG! 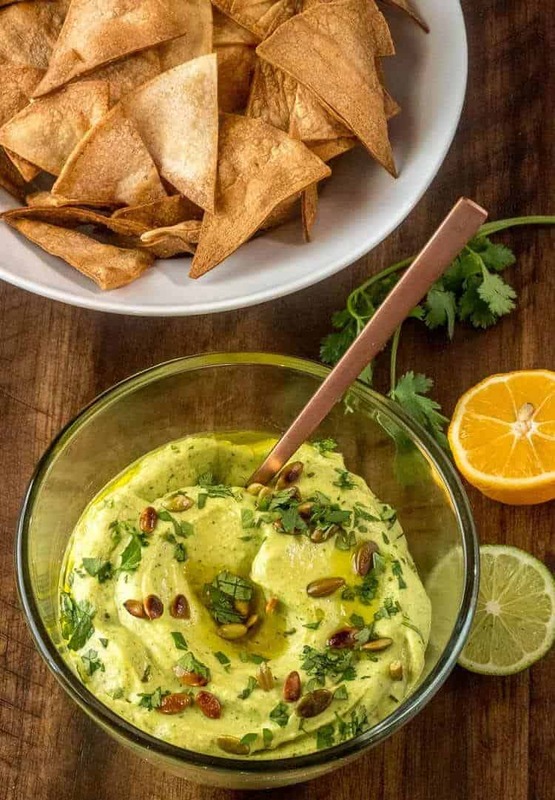 I love plantains, and I hadn't thought of pairing them with this hummus... I think I'll have to give it a try. Thanks Dominique! Oh my goodness, avocados are my new obsession. Seriously love them! 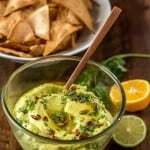 And this hummus with avocado sounds to die for! Yay for healthy obsessions! You'll have to give this one a try! This certainly looks like the dip of my dreams! The best of both worlds-hummus and guacamole. Looks so creamy and delicious and I love the spices in it. I love the flavors you have going on here!! I love both hummus and avocados!! And put them together, holy moly we have a party going on!! I can not wait to make your recipe because not only do I know that hubby and I will love it, but my sister and her kids will too! Yes, it's a party in your mouth for sure! Thanks Elaine! This sounds like a perfectly flavor packed appetizer for any party. I love all of the ingredients you have in there. 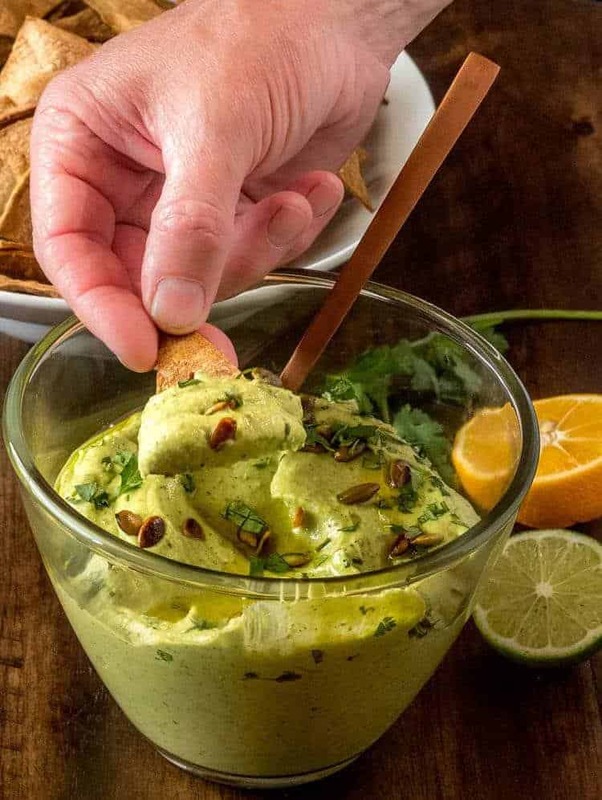 What a great idea to combine avocado into a hummus. Yum! Well we LOVE Mexican food. I can eat hummus by the spoonful (and often do). This sounds delicious. I would just fill a tortilla wrap with it and call it lunch. Lol. My husband and I were eating it by the spoonful after the photo shoot!